Have a look at the statements below, and think about how much you agree with each of them on a 1-5 scale (1 = strongly disagree, 5 = strongly agree). The real truth about 9/11 is being kept from the public. People need to wake up and start asking questions about 9/11. Legitimate questions about 9/11 are being suppressed by the government, the media, and academia. Reporters, scientists, and government officials are involved in a conspiracy to cover up important information about 9/11. An impartial, independent investigation of 9/11 would show once and for all that we’ve been lied to on a massive scale. Add up your scores, and you have a measure of how suspicious you are that there’s some kind of ongoing conspiracy surrounding 9/11. Now, do the same with these statements. The real truth about the moon landings is being kept from the public. People need to wake up and start asking questions about the moon landings. Legitimate questions about the moon landings are being suppressed by the government, the media, and academia. Reporters, scientists, and government officials are involved in a conspiracy to cover up important information about the moon landings. An impartial, independent investigation of the moon landings would show once and for all that we’ve been lied to on a massive scale. That looks familiar! This is called the FICS – the Flexible Inventory of Conspiracy Suspicions. It’s a sort of fill-in-the-blanks, conspiracy theory Mad Libs thing – a new innovation in measuring conspiracy theory beliefs. You can put nearly* any topic of public interest in there, and end up with a valid measure of suspicions that there’s a conspiracy to do with it. I’ve written an article proposing and validating this approach, and was fortunate enough to have it accepted to the British Journal of Psychology. It went up on Early View this week, so you can check it out if you have access to the journal. More info about it after the jump – including how this tells us something about the way that conspiracy beliefs are structured. We know that people’s opinions on conspiracy theories tend to hang together. Conspiracy theories are something that people tend to be generally into or not, to varying degrees. If you ask someone for their opinion on whether 9/11 was an inside job, you can use that information to predict (pretty accurately) what they think about whether Princess Diana was assassinated, whether the moon landing was faked, and whether the media is programming us with subliminal mind control. Current thought says this is because people’s worldviews are more or less “conspiracist” – that is, people have a general opinion on how common conspiracies are, the degree to which powerful people tend to conspire against the common good, how easy it is to cover up conspiracies, and so on. You can measure this tendency with questionnaires like Rob’s Generic Conspiracist Beliefs Scale, or Bruder et al.’s Conspiracy Mentality Questionnaire. People who score high on these scales tend to believe a lot of conspiracy theories; people who score low tend to believe relatively few. Of course it’s a pyramid. What I propose in the paper is a three-level model. Conspiracy mentality is at the top: your opinion on whether the world is a conspiratorial place pretty much governs how you think about conspiracies in general. It’s influenced by your personality and a variety of other individual-difference variables. The next level is suspicion about particular groups or topics. That’s influenced by the top level, of course, and each suspicion has its own influences – your left-right orientation might determine whether you think there’s something awfully suspicious about Barack Obama’s history, for instance. Alternatively, you might distrust a specific person or group, so you’re suspicious about things they’re involved in. The bottom level is beliefs in specific theories. Your opinion on theories that Obama was born in Kenya will be influenced by your suspicions about his history, but so will your opinion of the conspiracy theory that his years at Columbia University were fabricated, that he was never really involved with the things at Harvard he claimed to have done, and so on. Those individual theories aren’t that important – they sometimes might contradict one another, and you could still find them plausible because they all stem from a common suspicion. So that’s what the FICS is for – measuring that middle level of suspicion. 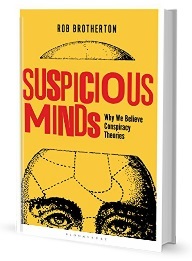 I think a lot of the time, when psychologists measure beliefs in specific conspiracy theories, suspicion is really what we’re interested in. We don’t care specifically about whether someone thinks that vaccines cause autism versus cause allergies versus contain microchips: we’re interested in the general suspicion that those theories reflect. *One of the findings was that the FICS doesn’t work for climate change, because it captures very conflicting conspiracy theories – “climate change is a hoax,” and “oil interests are conspiring to make people believe that climate change is a hoax.” Unlike many contradictory conspiracy theories about the same thing, these don’t tend to be correlated positively, because they don’t really share any common assumptions – it may also be relevant that the second theory is really a meta-conspiracy-theory, that the first conspiracy theory is itself the result of a conspiracy. This entry was posted in Social psychology and tagged 9/11, measurement, methodology, suspicion. Bookmark the permalink. I have always been fascinated by conspiracy theories. I dont belive in any of them, but by fascination is still because I like to think how plausible they could be. What I also find fascinating is how conspiracy theory also seem to mean “false”. If I say media is biased towards certain political views I belive in conspiracy theories. If I see tendencies for a new world order (even stated explicitly by people of power) I am false because I belive in in conspiracy theories. What I think is that there may be truth to some conspiracy theories, but it often isnt as sinister or thought out as people seem to think. The new world order is just a centralisation of power, not something thought of a hundred years ago by “lizard people”. The illuminati does not exist, but atheists in popular culture use the iconography of illuminati in their films and movies as a wink to fellow people of same belief. What I am trying to say is that sometimes the mechanisms for the conspiracy are really there, but its not so well thought out as “conspiracy nuts” say. Sometimes its the chicken and the egg thing. I.e the 9/11 truthers. They seem to think that 9/11 was orchestrated by the US goverment to go to war with muslim countries. But there could be other ways to interpret the same conspiracy. 1) What we saw was what we got, 2) the goverment didnt orchestrate it, but allowed it to happen for the reasons of going to war. Again, I dont belive in any conspiracy theories, but I dont necessarily disbelieve it either just because it is that. People conspire. That is a fact. But on such large scales makes it less plausible. As a rule, I do not subscribe to conspiracy theories. Nevertheless I do indulge in them periodically. Is this self-contradictory? Definitely, but the most important part of the equation is what one gets out of believing a conspiracy, and I have observed during those moments when I take to it that (1) the world seems less chaotic when one believes a conspiracy theory—that it appears more well-ordered than it actually is—and (2) it relieves one of that unpleasant sense of personal responsibility where one must make the improvements to one’s life—with a conspiracy, everything is always the fault of someone else one never actually sees. To get an idea of what this knowledge feels like, read some Lovecraft stories and observe how his characters’ nerves get frayed from seeing how many things correlate together. A good start would be “The Call of Cthulhu” from 1926. Go to fruition. Now I have a money trail to follow. Bad about yourself for a change. Calm down, if you please, and tell me about your unrelenting stalking. I find myself curious. Also, how, exactly, is it MY fault that you can’t get help? I hope I misread that. Did the Virgin Mary die? Or, did she ascend into heaven? Did Jesus walk on water? Rise from the dead? Is Christian dogma hiding the truth? Is this a Conspiracy? Questions hurt my head. Dr Jolley and his ilk are but mildly amusing. These waste-of-spacers are cluttering good walls with paper that cheapen the degrees that others worked hard to earn. Sitting in his cosy arm chair wearing rose-tinted glasses, he’d do better popping zits and learning about real life than indulge his ego. Gang-stalking happens. I have enough footage to put his theory to shame. And if the good doctor would stop to think clearly and intelligently, social media is the vehicle that carries news, gossip and hatred far and wide. He must not be aware that people have harmed themselves or been harmed because their pictures were posted online and the harassment followed them. Dr Jolley, put your dirty pjs in the laundry basket so mummy can wash them.